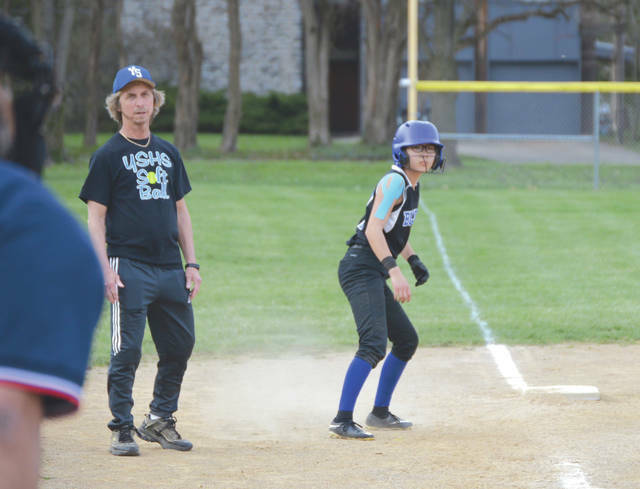 Despite the Bulldogs giving up 13 runs in the second inning, Yellow Springs coach Jim DeLong and second baseman Rebecca Spencer both worked hard to keep their team upbeat throughout Thursday’s 21-13 loss to Marshall at Gaunt Park. Yellow Springs pitcher Abegayle Florence delivers a pitch, April 11 in a girls high school softball game against visiting Marshall, at Gaunt Park. Yellow Springs freshman Ava Schell smacks an infield hit in the second inning of Thursday’s high school softball game at Gaunt Park. Thurgood Marshall first baseman Daisha Williams readies to make the tag on Lily Rainey of Yellow Springs for an infield out in the third inning, April 11, at Gaunt Park in Yellow Springs. 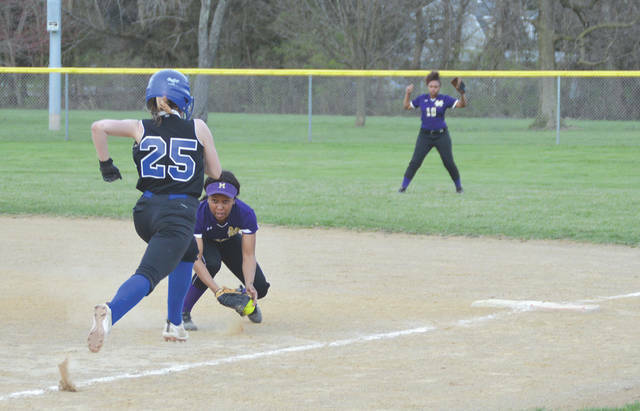 YELLOW SPRINGS — Whether it was the blustery wind, or just bad control of their pitches, Yellow Springs had dug itself a deep hole and couldn’t quite get out of it, in a 21-13 home loss to Thurgood Marshall, April 11 at Gaunt Park. The thing Bulldogs coach Jim DeLong liked most about the game was that his team never gave up. Yellow Springs roared out to a 5-1 lead after the first inning of play, but then Marshall capitalized on six hits and eight walks to score 13 runs in its half of the second. The Cougars sent 17 batters to the plate in the inning. A long, drawn-out onslaught like that can drain the enthusiasm out any team, and pitcher Abegayle Florence at times had to stop and take a deep breath to get refocused. But throughout the ordeal, her infielders — especially second baseman Rebecca Spencer, who would say things to get Florence to smile — were there to offer much needed support. Springs yielded four more runs to the Cougars in the third inning, to give Marshall an 18-9 lead, but then Florence gave up fewer walks and held the visitors to three runs the rest of the way. DeLong was limited to a roster of nine players for Thursday’s game, due to some school committments his other players had to attend. Bulldogs batters reached base on nine walks, two hit batsmen and a couple of Cougars fielding errors. Spencer got on base on four of her five at-bats, scoring four runs, and she smacked a double in the seventh inning. 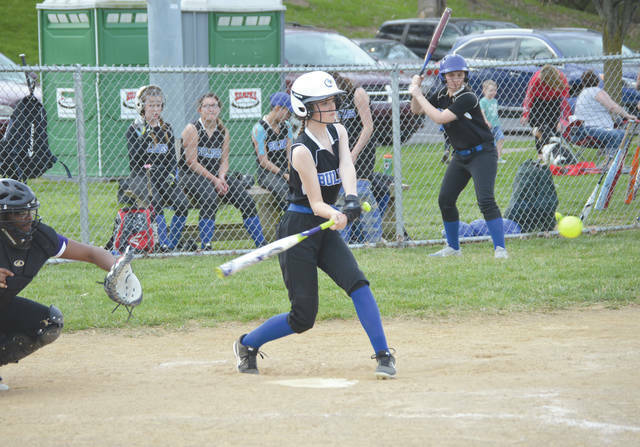 Lily Rainey drove in two Bulldogs runs, Zoe Lafferty scored three times, Florence scored twice and drove in another run, and Ava Schell also scored a couple runs in the loss. Marshall’s Callie Hester almost hit for the cycle in the Cougars win. Hester went 4-for-7 at the plate with three singles, a double and a triple, three runs scored and another four runs driven in. The Cougars drew 18 walks and had 14 hits in the win, and are now 4-2 this season. They will play next on Saturday, April 13 on the road against Columbus East. Cougars coach Tony Duncan said it’s been a long week for his players. Yellow Springs (3-3) has a day to rest, then they’re back in action on Saturday, April 13 with a double header at Trotwood-Madison. The first game is scheduled for a noon start, with Game 2 set to start at 2 p.m.
https://www.fairborndailyherald.com/wp-content/uploads/sites/50/2019/04/web1_DeLongRebeccaSpencer_PS.jpgDespite the Bulldogs giving up 13 runs in the second inning, Yellow Springs coach Jim DeLong and second baseman Rebecca Spencer both worked hard to keep their team upbeat throughout Thursday’s 21-13 loss to Marshall at Gaunt Park. 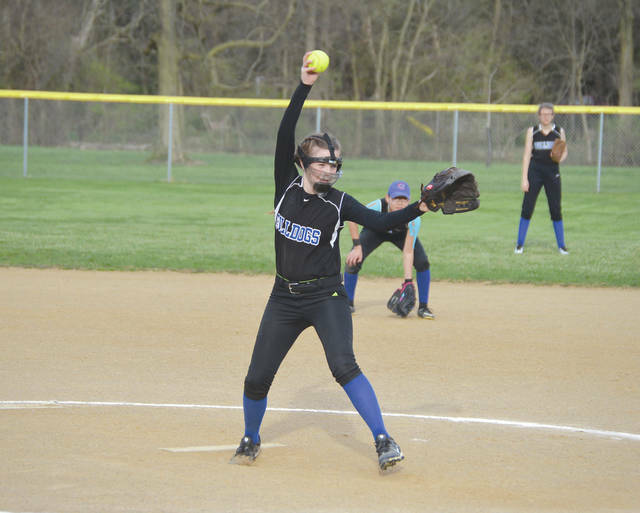 https://www.fairborndailyherald.com/wp-content/uploads/sites/50/2019/04/web1_AbegayleFlorence_PS.jpgYellow Springs pitcher Abegayle Florence delivers a pitch, April 11 in a girls high school softball game against visiting Marshall, at Gaunt Park. https://www.fairborndailyherald.com/wp-content/uploads/sites/50/2019/04/web1_AvaSchellHit_PS.jpgYellow Springs freshman Ava Schell smacks an infield hit in the second inning of Thursday’s high school softball game at Gaunt Park. https://www.fairborndailyherald.com/wp-content/uploads/sites/50/2019/04/web1_DaishaWilliamsLilyRainey_PS.jpgThurgood Marshall first baseman Daisha Williams readies to make the tag on Lily Rainey of Yellow Springs for an infield out in the third inning, April 11, at Gaunt Park in Yellow Springs.